You should inspect a roof from the outside as well as the underside, usually from the attic. An asphalt shingle roof typically lasts 12 to 25 years. An “ice dam” is a buildup of ice at the roof slope bottom — caused by heat escaping from the house and melting snow on the upper parts of the roof which freezes after it runs down to the colder eave area. The “dead load” is the permanent load imposed on a structure by the building materials. The “live load” varies and is exerted by outside forces like wind, rain and snow. The pitch is the slope of the roof, expressed as a ratio of the rise over the run. Valley flashings are used where two different roof slopes come together to form a trough. Valleys have a lower slope than the adjacent roof surfaces. The Study Sessions will help you make your way through the material. The Quick Quizzes will help you check your progress. The Field Exercises will help turn your knowledge into real-world experience. 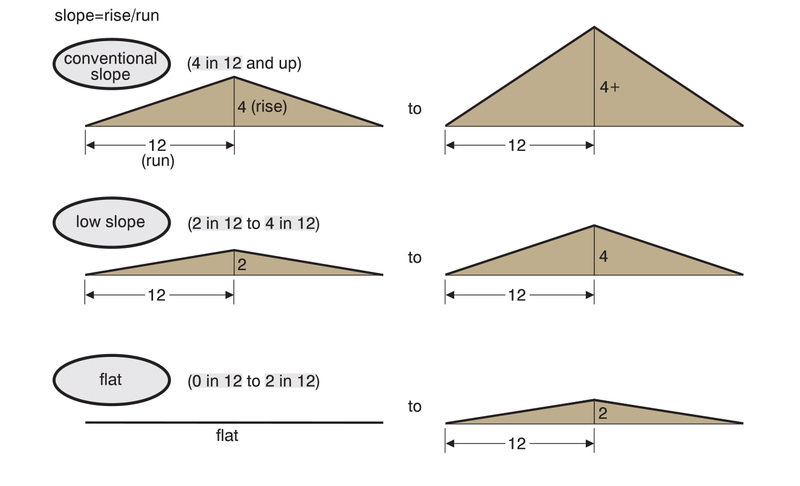 Roof slopes — This illustration defines roofers’ terms for flat, low slope and conventional roofs. It is from Roofing Course, General Strategies Chapter. All of our 10 Courses contain easy-to-understand illustrations that help you understand the subject.